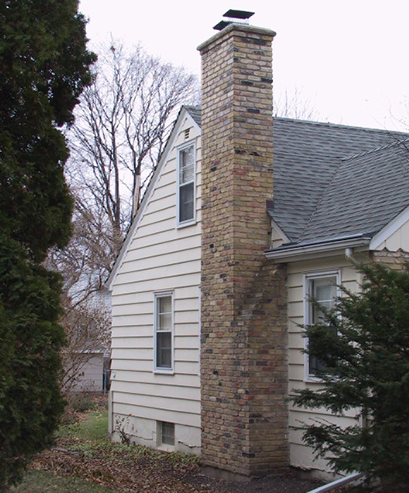 Chimney Reconstruction Quotes Minneapolis MN | Dayco General Inc. When it comes to chimney reconstruction quotes you should be aware that older homes commonly have structural problems to resolve and that can include the need for chimney reconstruction. You may be astonished by the amount of work needed to bring a chimney from old to new with revised standards and building codes. Preserving the historical visual appeal in homes built prior to 1920 can be a challenge, while yet identifying new safety standards of chimney and most importantly chimney liners. Liners keep your home and family secure. They work to vent the gases and toxic fumes from the home to the atmosphere. Clay liners existed in the 1860’s but were not required in code until 1927. Those codes weren’t enforced until the 1940’s. It is recommended to have a qualified professional inspect the chimney prior to purchasing if you are thinking about purchasing a historic home which possibly requires a chimney reconstruction quote. These type projects are not always cheap and could cost more than many other type restorations. Conventional home inspectors do not ordinarily have training for chimney’s, so you will want an industry professional to inspect your chimney when you are considering a historic home or home needing a chimney reconstruction quote. The first step in a chimney reconstruction quote is to determine the correct size and type of liner that is best suited to the parameters of fireplace. Our professionals here at Dayco General are experienced in making these determinations. This is very rarely a do-it-yourself project. and repair estimate of your chimney. Next, the fireplaces need to be the proper size for current city code. Historic homes sometimes have fireplaces too shallow to burn wood. They may have initially been coal burning or ceramic heaters. Those original types of fireplaces could possibly be very dangerous and emit carbon monoxide. These small fireplaces can sometimes be modified safely into a gas burning fireplace. This type of solution has, in many cases, proven to be a safe way to do a chimney restoration that meets building code. Lastly, ensure the outside of your chimney is inspected for missing or delaminated mortar and damaged brickwork or stone. Historic mortar was sometimes thin (called “butter joints”) especially in Victorian-era chimneys. It can get difficult at times to find a satisfactory match for bricks for these old Chimneys. That’s why it’s for good reason that you can call on the expertise of the people at Dayco General for your chimney Reconstruction Quotes Minneapolis and your chimney Reconstruction Quotes St. Paul.